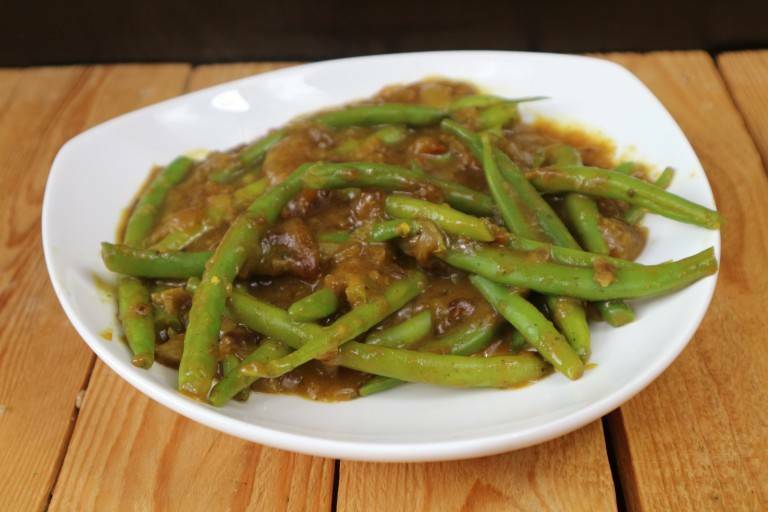 A vegan variation of Monique van der Vloed on the Indian dish Sajoer beans. She has included here in Greensweet Extra Sweet. Grind the pieces of onion, herbs and spices into a paste in the food processor. Fry the finely chopped onion and garlic in a frying pan with a non-stick coating. Stir in the locust bean gum with a little warm water. Add the rest of the ingredients and quench with water. Keep moving the beans well. Extinguish again with water and lower the heat. Put the lid on the pan and leave it for 15 minutes under regular stirring and if necessary add water, smother. When the beans are al dente, remove the pan from the heat. Divide the sajur over two plates. Tasty with cooked Quinoa, brown rice, oats or millet!